Anyone interested in pursuing a religious vocation is very welcome to have some conversations with our priest and/or staff. Simply call the office to speak to someone about making an appointment time. 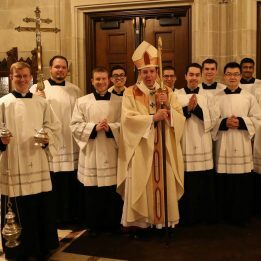 We recommend that you visit the Detroit Priest website for inspiration, news, and guidance. The Archdiocese of Detroit website also has some useful information about choosing a religious vocation.